Jennifer: If you’d asked me this a few years ago, I’d have said historical fiction, straight up. But I’ve been thinking about my approach to historical fiction recently, and now I’d say my work falls into the realm of the “plausible meeting the possible”: I find blank spaces in recorded history and then create characters who fill those gaps in a realistic and convincing way. My characters – often living in the shadow of well-known historical figures – are products of my imagination, but the world in which they live and the events that affect their lives are drawn entirely from the historical record. Greer: I love that! Next question: do you consider yourself a historian? Jennifer: I do, to the point that I find it hard at times to remember that I’m also a writer. I grew up in a house that revolved around history – my father is an academic who taught the history of the world wars for almost fifty years – and I went to graduate school with the intention of becoming a history professor as well. By the time I obtained my doctorate in 1997, however, the job market had pretty much dried up for specialists in British social history. I turned to editing instead, and spent a decade doing that before I listened to the “tug on the sleeve of my heart,” as Anne Lamott terms it, and started work on my first novel. But I still approach everything I do with the mindset of a historian. Jennifer: The challenge, as I’m sure you’ve also found, is the absence of women from so much of our recorded history. Women’s voices are missing in so many of the sources we consult, and at times I’ve been tempted to start screaming when I hit yet another dead end in my research. (Of course, such moments only occur in the stuffiest and most solemn libraries!) But those absences can also be exciting, in that they provoke me to dig deeper and think more creatively. 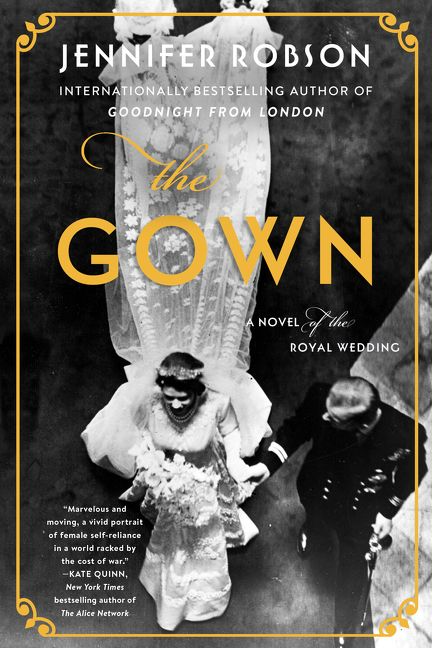 When I was researching The Gown, for example, I expected to find some evidence of contemporary interest in the women who made Princess Elizabeth’s wedding gown, but no one, among the thousands of journalists who flocked to Britain in 1947 to cover the wedding, interviewed or even discussed the work done by the actual women who made the gown. And that void in the historical record propelled me to take a different approach to my research. If I couldn’t learn from the women who made the gown then, I could learn from women doing similar work today, and so I went to England to learn from the master embroiderers at Hand & Lock. Not only did I gain incredibly valuable insights into the approaches and techniques used by skilled embroiderers, but I also was put in touch with Betty Foster, the last surviving seamstress who worked on the gown, and her insights transformed my understanding of the lives of my characters. But I never would have found Betty if I hadn’t run into those brick walls early in my research. Greer: There are rather a lot of gaps in my literary education, so there are probably a boatload of classics I should read, but here’s the one I actually feel bad about: I’ve never read Tolstoy’s Anna Karenina. I’m sure I will love it. It comes up constantly. But between everything I read for research, for blurbs, for keeping current in my field, not to mention all of those pesky non-reading tasks (writing, children, etc.) in my life… it just hasn’t made it to the top of the list. Maybe I need to make that a goal for 2020! For more about Jennifer and her books, visit http://www.jennifer-robson.com.